Lehenga style sari is fine fusion of two elegant garments – lehenga and saree. Being the result of a blend of two classy outfits, this garment has a stylish and contemporary look. It is also dazzling because of the typical cheerful aura that it carries. Apt for all celebrations that require impressive dressing, this attire receives thumbs up from every woman. The blouse of this style of saree is highly trendy, as you can experiment with choli-cut blouse, spaghetti strap blouse, deep-neck cut blouse, and so on. No matter what style you choose, this dress will not disappoint you when you wish to look absolutely stunning. How is the lehenga style saree draped? This outfit comes with a great relief for women who wish to wear sari for the first time or still have not mastered the art of wearing it. When you choose this outfit, you are not required to make any pleats. First, wear a petticoat and tie it with a comfortable tightness at the waist. Next, hold the end of the garment close to your waist where you have tied the petticoat in a way that the embellished border faces outward and touches the feet. Now, tuck in the end at the waist. Next, wrap around the rest of the fabric around your waist until you get the pallu in the desired length. Lastly, take the pallu across chest and let it fall from the shoulder. That is it. Why lehenga style Sarees are so much in vogue? Popularity of this garment has gone up manifold because of its repeated wearing by TV actresses and movie stars. Whenever, there occurs a celebration for engagements or weddings, most of the actresses are shown wearing breathtaking lehenga style saris. Similarly, in real life, movie stars choose to wear this attire when they visit award functions or attend reality shows. These outfits are so attractive that most women fall in love with them and wish to include them in their wardrobe. At YOSARI, you will find such elegant garments in large numbers. All our products are made from high quality raw materials, which ensure that only fine-quality items reach our customers. Check out our collection right away. How are lehenga style Sarees decorated? This outfit can be decorated in as many ways as you can imagine. With embroidery work done with threads ranging from satin, silk to gold, you will have beautiful garments to choose from. Apart from it, other materials used for its decoration include pearls, beads, rhinestones, sequins, stones, gota, etc. In fact, some dresses feature a combination of all the above-mentioned materials, which create not just a costume but also a piece of gorgeous art. Is it for every woman? Yes, of course. Lehenga style saree is great attire for women of all the age groups. Whether you are a college goer, in your mid-thirties or in 50s, you could wear this garment and steal the limelight at every event. At YOSARI, we understand how every woman has a different preference in terms of colors, print patterns, and designs. That is why we have made available these sarees in pastel shades, dark hues, with heavy embellishments, light embroidery, dark and light prints, and so on. Browse through our selection and we are sure you will find a garment that would add glamor to your personality. 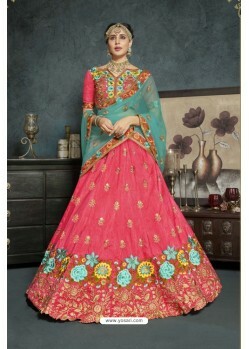 From where you should purchase lehenga style Sarees? Although, a variety of shops sell these outfits, it is best to go for online shopping. The reason is simple when you shop online, you need not travel at all. By simply accessing the website, you could make a selection of your garments and never need to go through the painful experience of hopping from one showroom to another. Right from your browser, you can visit YOSARI and check the variety of options available. The specialty of these garments is the fact that each of them has been carefully designed and readied by our designer team. Hence, all our designs are 100% original. Moreover, our designers prepare the design patterns keeping in consideration the current trend. Consequently, at www.yosari.com, you have a good chance of finding the latest designs in colors that are most favored by fashionistas. As for blouses, we have blouse pieces made from a host of comfort promising fabrics. As both embellished and printed fabrics are available, you can easily select the one that meets your requirement. Once chosen, mention your measurements and let our trained tailors stitch the perfect blouse for you, which will be delivered conveniently to you. When you shop in a brick and mortar store, you run the risk of damaging the product while carrying it home. Nevertheless, when you shop from YOSARI, there is no such risk. All our products are properly packed so that the garments stay safe during transportation and reach the residences of our customers in the perfect form. Not only by customers in India, our products are appreciated by clients of different countries - Australia, USA, UK and Canada and we have been successfully delivering them our products. There’s more; as our valued customer, you get the 14-day money back guarantee with every item. In a rare case, if you find the item not up to the way you expected it to be, you could return it to us and have the money back.